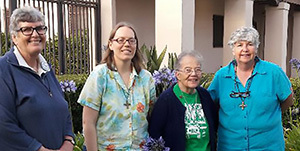 The Sisters of Notre Dame de Namur have been an enduring presence in Saint Columbkille Parish in Los Angeles since the early 1920’s, when they accepted the invitation to serve as educators in the school. Over the years, the sisters have moved from being full time educators to other ministries serving the parish and neighborhood. The current community includes Sisters Caroline Sanchez, Mary Ellen Howard, Nancy Uhl and Sarah Cieplinski. They come from varied generations, hometowns, ethnicities and life experiences. They represent two provinces and are one of the SNDdeN formation houses in the United States. It takes only a few minutes in their presence to sense how much they appreciate and enjoy one another’s company and how committed they are to the Notre Dame mission, the parish, neighborhood and their ministries. Saint Columbkille Parish is largely Mexican - American with a significant number of African-Americans as well as immigrants from Central America and Africa in the neighborhood. The departure of manufacturing jobs from the area and high housing costs has increased the number of people living in poverty as well as expanded the number of people who are homeless. The sisters are immersed fabric of this community and walk with their friends and neighbors in difficult circumstances doing all they can to minister to those in need. Sister Caroline, who grew up in the parish returned to Saint Columbkille as an ESL teacher and school librarian after serving as a nurse in the SNDdeN retirement community in California for sixteen years. She also served as the Notre Dame AmeriCorp Director for Los Angeles. Currently, Caroline ministers as a volunteer in the after school homework program and works with priests who come to Los Angeles from other countries helping them develop their English language skills. This past September, Sister Caroline will receive the Papal Honor – Benemerenti on September 3rd for her outstanding service to the Archdiocese and community. Sister Mary Ellen came to Saint Columbkille in 2014 after thirty years as a missionary in Kenya, a year in Zimbabwe and several years in service to those living in poverty in Sacramento. After taking classes, she became certified to serve as chaplain at the Los Angeles County Women’s Jail and ministers there three days a week, serving women as they wait for their trial date in the court system. In addition, she works with Sister Caroline in the after school homework program. Sister Nancy, a longstanding Los Angeles resident who spent the first part of her life as wife, mother and social activist, began her discernment process when her daughter was grown and several years after her husband passed away. In 2016, at the conclusion of her formation experience, Sister Nancy professed her perpetual vows as a Sister of Notre Dame de Namur. She worked as a parish counselor in a neighboring parish for several years and was appointed to the position of US Director of the SNDdeN Ministry of Invitation in 2017. Sister Sarah grew up in Phoenix and met the Sisters of Notre Dame de Namur in her senior year of high school. She entered the Ohio province after graduating from college and teaching for three years. After entering, Sister Sarah lived at Saint Columbkill as part of her novitiate mission experience and also served as an educator in Arizona, Kentucky and Los Angeles. She is currently pursuing a master’s degree in special education at Saint Mary’s University in Los Angeles.